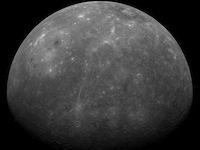 More than six and a half years ago, NASA launched the MESSENGER probe. Since its launch, it has traveled around the inner solar system, flying by Earth once, Venus twice, and Mercury three times. Yesterday, MESSENGER finished its long journey, and settled into orbit around Mercury, where it will continue to collect data and send it home for the next year (or, hopefully, longer). This is the first time that any human launched probe has ever been put into orbit around Mercury, and is a phenomenal engineering and scientific achievement. Aside from the indomitable human desire to explore the universe, the sheer scale of this project boggles the mind, and cannot fail to impress. To get some handle on how truly amazing it is to launch a probe from Earth and get it into orbit around Mercury, let’s play with some back-of-the-envelope numbers. Let’s try to scale our solar system in more human terms. We start by comparing the sun to a beach ball. The sun is (according to Google), about 1.4 million kilometers in diameter, while a beach ball is about 120 cm. Our scaling factor is then about 10-9, or about 0.000000001. At this scale, the Earth and Venus are a little more than 1.25 centimeters in diameter, which is about the size of glass marble. The moon would be less than 4 mm in diameter, and Mercury would be about 5 mm in diameter—about the size of a ball bearing. These are the main players in our little celestial drama. The sun is quite large in comparison, and Earth, Venus, the Moon, and Mercury all fit together at a somewhat smaller scale. That a minuscule probe launched from a marble could find its way to another marble is pretty impressive, but here’s the really astonishing part: even at this incredibly reduced scale, the distance from the Earth to the sun would be almost 150 meters, or the length of one and a half football fields (give or take). Mercury is about half that distance, which means that Mercury could be as far away as two football fields, or as close as three quarters of a football field, depending on where the planets are in their orbits. So here is how I imagine the situation: two marbles, a couple of ball bearings, and a beach ball have been placed in a large field. Because motion is relative, we fix the position of one of the marbles to represent our location on Earth, and let the other objects scoot around the field to simulate the motions of the planets and sun. From the position of the marble that represents Earth, a sniper is asked to hit the ball bearing that represents Mercury. Even as hard as this shot would be, reality is even more challenging. Not only would the sniper have to hit the ball bearing that represents Mercury, he would have to do so while taking into account the gravitation effects of Venus, Earth, the Moon, Mercury, and the sun (these could be represented, I suppose, by very strong winds); and he would be armed not with a standard sized bullet, but with a bullet smaller than a single atom of carbon. The universe is immense, and we are insignificant beings living on a tiny little mote of dust that flies around a vast emptiness at incredible speeds. Yet, somehow, human intelligence, and curiosity, and work have given us the ability to send our senses into the void, and find these tiny specks of dust. I am in awe.